GOLD CORE LINE CM3 is a product containing crystal pure tri-creatine malate and beta-alanine. 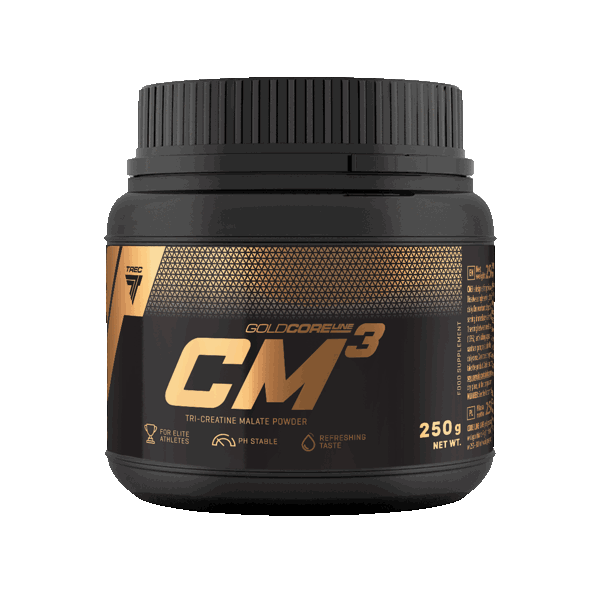 GOLD CORE LINE CM3 contains creatine, which increases physical performance over successive short, high-intensity bursts of physical exercise. Consuming 3 g of creatine per day provide a preferable effect. GOLD CORE LINE CM3 is recommended as a product which helps to achieve the top condition, especially in power as well as power and speed disciplines. GOLD CORE LINE CM3 is designed for professional athletes. Recommended daily portion is 7 g (1 scoop). Dissolve a single serving of the product – 3,5 g (0,5 scoop) in 250–300 ml of water in a shaker. Take 2 servings daily. On workout days: 1 serving in the morning after getting up, 1 serving 30 min. before the training or 1 serving immediately after the training. On non-workout days: 1 serving in the morning after getting up, 1 serving between meals or 1 serving at bedtime. INGREDIENTS: tri-creatine malate (77,1%); beta-alanine (15%); anti-caking agent – silicone dioxide; aromas; sweetener – sucralose; thickeners – cellulose gum, xanthan gum; colour for the orange flavour – beta-carotene.